and publicists of celebrities worldwide. Easy to use interface and search. Easily get contact info for celebrities worldwide. Our website provides the email address and phone number for their official agents, managers, and publicists. Easily export multiple contacts into a CSV for use in your own internal tools, or for export for use in programs like Microsoft Excel and Google Sheets. Not sure how to contact a celebrity? 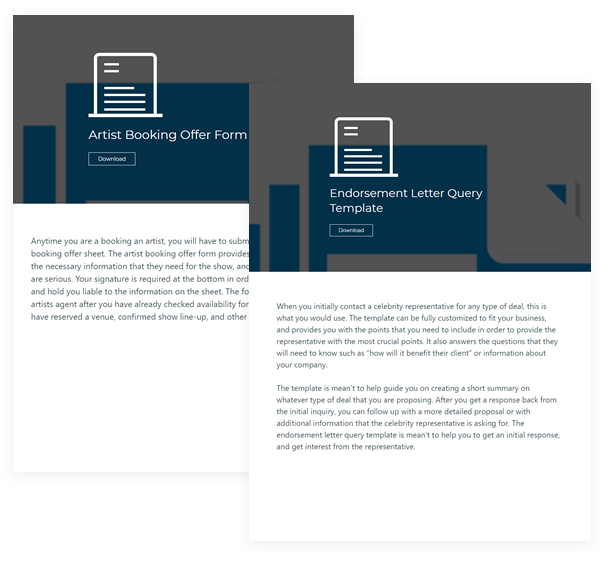 Our tested and customizable email templates help you to get the response you want. 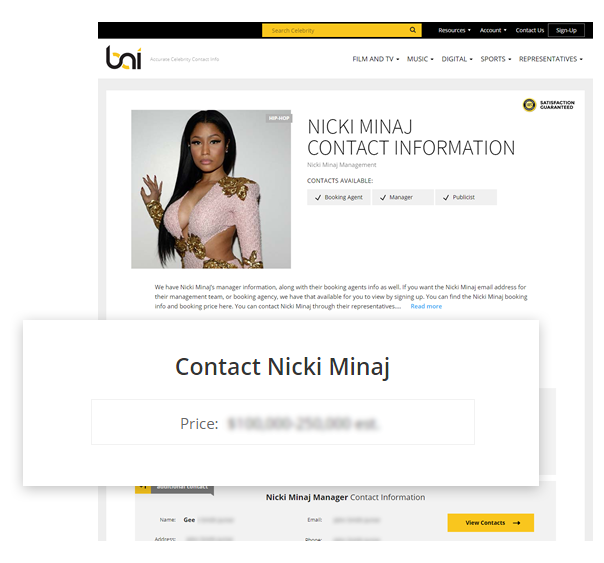 Get booking price estimates for specific celebrities for booking them. Use this information to help you in your budget planning. 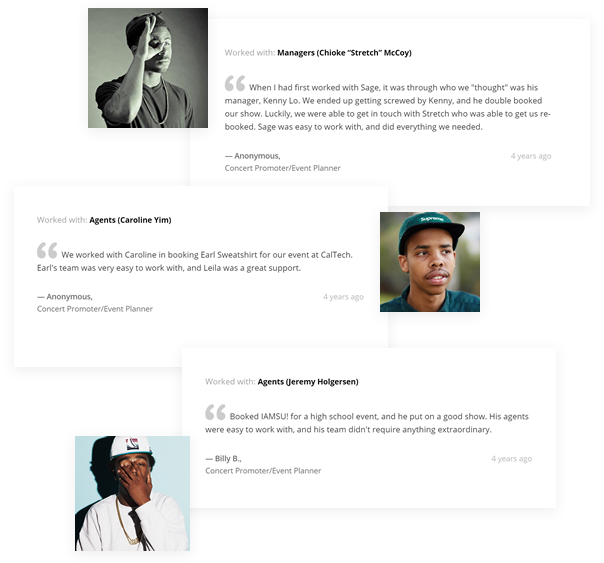 Read reviews and advice from other members on their experience working with celebrities. We provide you with official contacts. Be confident in knowing that you are working with the right person. We have thousands of celebrities listed, but if you can’t find a celebrity in our database, we will research and find the celebrity’s contact info for you at no extra cost. Have questions on how to contact a celebrity? Get answers from industry experts and other members in our Q&A. Our database is built with you in mind. Built with feedback from businesses, concert promoters, journalists, non-profits and many others. I use Bookingagentinfo.com to reach out to managers and publicists of celebrities so I can get press passes for shows in my area to interview celebrities for my blog. What is Booking Agent Info? We provide ourselves on having the most accurate celebrity contact info available. Our database is updated daily, and our team works around the clock to make sure that the information in our database is up-to-date. What type of contact information do you provide? 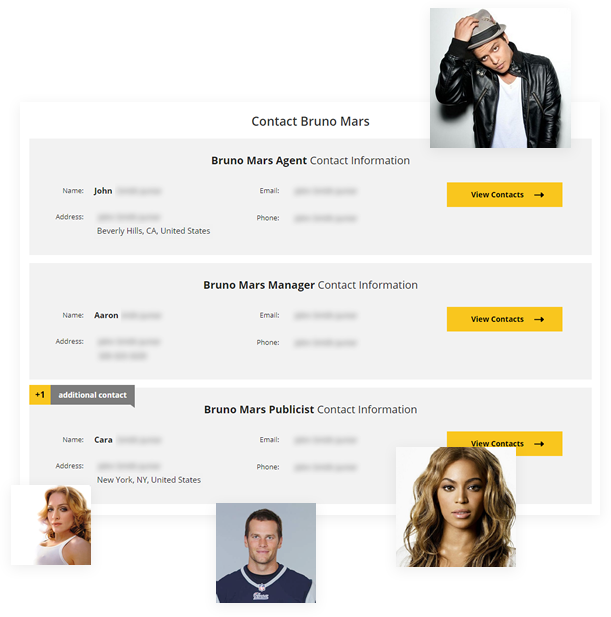 Our database provides contact information for the agents, managers, and publicists of celebrities. We aim to provide the email, phone number, and mailing address for each representative when available. As a member, you get unlimited searches within our database. In addition to this, members are able to make info requests to get specific celebrities added to our database if they are not already listed.